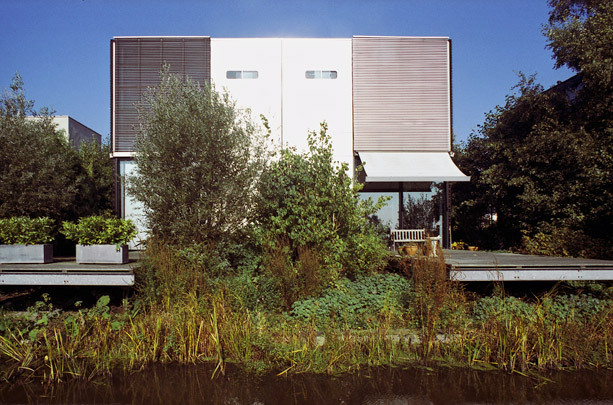 In 1989 the designer’s association Delft Design organized together with Delft Town Development a competition for semi-detached houses, after which 12 mostly young architects were able to get their schemes built. The most eye-catching of these are the twin villas erected in stainless steel and glass by cepezed. In this basic rectangular box, a fixed service block for ablutions and cooking placed along the diagonal extends up through all three storeys. The building is not just a technological statement by Jan Pesman, a leading light in Dutch High-Tech; it is functional, inhabitable and spatially interesting too.